It wasn’t because I would be responsible for cleaning the fish bowl. Because yes, I am responsible for cleaning the fish bowl. It wasn’t because I would have to remind the girls to feed the fish every day. Because yes, I do have to remind them to feed the fish. It wasn’t even because I had to find the place to put a fish bowl. Because yes, I did have to rearrange things in my living room to make space for the fish bowl. It was because goldfish die. It’s not that I’m avoiding the whole topic of grief and death, it’s just that I’ve already had to talk to them extensively about the topic. We’ve had four family members pass away in the past three years. I was upset because I would be the one who would have to console the girls when the fish die. 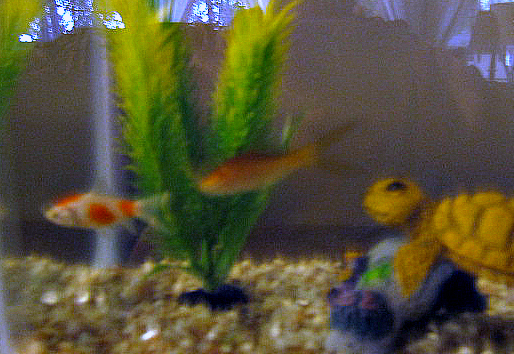 After I pouted and resented these darn fish for at least a day, I decided that these fish were NOT going to die. I drove the girls to the pet store, and we bought a new, bigger tank. They each picked out a toy turtle for the fish to swim around. I bought gravel for the bottom of the tank and chemicals to help keep those goldfish healthy. I EMBRACED THE FISH! I changed at least 25% of that fish water every three days. We carefully fed them only a pinch of fish food. Lily would sit by the fish tank and read to them before bedtime. We coddled and cared for those fish. The Sunday morning after our camping trip in the backyard, we came into the house. I gasped in horror when I glanced over at the fish tank. Despite all my efforts, poor little Spotty was floating at the top of the water. Even though they were technically Emmy’s birthday present, Lily was devastated. She was the one that had sat by the fish and watched them for hours and had taken charge of their feeding schedule. She reminded me to clean their water. She was the one that would be the most upset about losing the fish. 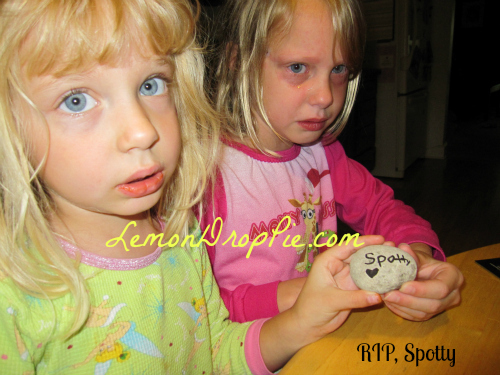 When she found out that Spotty was dead, I arranged a quick funeral and graveside service before we had to leave for church, which ended up being quite appropriate for little Spotty. The funeral helped Lily feel better, her tears dried, and after all, we still had Stripe to take care of. A month later, Stripe is still doing swimmingly. We even arranged to someone to come feed him when we were out of town over Labor Day weekend. I’m crossing my fingers that Stripe will stay with us just a little bit longer. OH, the tears! That picture just broke my heart! If it make you feel any better, Jude's goldfish Arcius, is now almost 2 years old! He's massive. I'm afraid I'm going to have to buy him a new tank! Ah, poor Lily. I have been offered fish and refused them for this exact reason. Although Sprite is frequently talking about when Blue will die, since she's pretty old, but I think when it actually happens, she'll be pretty upset about it. We had a big pond in our backyard stocked with goldfish. Our girls named a lot of them and then the heron would come for her lunch and dinner and slowly all our fish were gone. It was sad, and our girls gave up naming the fish. Ugh, fish… the hardest pet to have! I feel so bad for Lily in that pic because I know how she feels! Abby is still talking about her fish. We secretly replaced the first one not even 12 hours after we bought it and in no less then 12 more hours it was gone again. We finally told her that our water isn't good for fish but months later she'll get teary and say she misses her Nemo. I'll keep my fingers crossed that your second fish lives a LONG life! My recent post Hi There! Oh my! That reminds me of the fish we once had, that got into a fight with a visiting neighbour fish (in his own bowl). In the end our fish apparently jumped out of his bowl and ended up behind a very large cupboard. My parents then got a canary bird. We had seven of them in a row, all named the same! That's the exact reason we gave up our aquarium. The kids just couldn't take it when they'd lose a fish. It was devastating! Holding out hope for your Stripe! I almost feel bad posting that picture of Lily. She was so upset! I totally understand why you gave up your aquarium!